I didn’t write this, a dude called Faf Driscoll did. Heres the link to the article. I just summarized it for reference for myself. Thanks Driscoll! Before the Trinity: Why Can’t There Be Three Different Gods? 1 Kings = Elijah and the prophets of Baal have the ‘God-off’ and Elijah shows his God is the REAL God = shows false Gods to be false and the true God to be TRUE. Conclusion – There’s only one God. God is ONE, the only, living, true God. What about Jesus and the Holy Spirit? How CAN there be three personas, ONE God, in perfect unity? What DOES the Bible have to say confirming the deity of Jesus as God the man, THE GOD MAN. Colossians 1 = Jesus is THE image of the invisible God. By, through and in Him all things hold together. Philippians 2:5-11 = Being in very nature God, didn’t consider equality with God something to be grasped, but humbled himself. Now he has the name above all names…BOOM! John 8 = Jesus says “Before God was, I AM”…digging straight from God’s words way back in Exodus 3:14, Jesus commits MASSIVE blaspheme here if He’s not completely God. John 10:30-31 = Jesus says; “I and the Father are One”…that would seem to show that He is God! John 14:10 = Jesus speaks clearly of himself being God here; I am in the Father, and the Father in me! ALL OF REVELATION = All the angels say GET UP when ppl fall down to them, and they say; “Only worship God!” but they are ok with everyone bowing to Jesus!. Revelation 22:13 and 1:8 = Alpha and Omega. Jesus is literally the first and last of the Greek alphabet, He. Is. All. Matthew 28 = The Great Commission = “Baptize in the name of the Father, the Son, and the Holy Spirit” = Jesus here DEFINATELY connects the Holy Spirit to God the Father and God the Son, so that’s a HUGE reason why! Acts 28:25-36 = Sees the apostles arguing that the Holy Spirit himself spoke to the forefathers of Israel through the prophets! In the OT, when the Holy Spirit speaks, GOD speaks. Romans 8, Hebrews 3:7 + 4:7, Acts 5:3-4 and Revelation 1:4-5 is helpful for investigating the God that is the Holy Spirit…a distinct persona from the Father and Son, as each play a distinctly different role, but all in perfect unity together.The most helpful was investigating the characteristics of the Holy Spirit that point to Him being God. 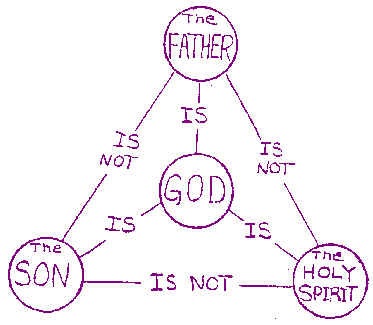 If the Father isn’t God, then He isn’t the ONE true God as He claims. If Jesus didn’t come as fully God and fully man, fully crucified and resurrected, we can’t be regenerated. We are saved by the blood of the Son. If the Holy Spirit didn’t exist as His own persona but still completely God, we can’t be reconciled to God. Salvation comes BY the regenerative work of the Spirit, THROUGH the blood of Jesus, TO the glory of God the Father. There is One God, three personas, each serving a distinctly different role, but each in very nature, and equally to its others, God.